Fazal Sheikh’s photographs and installation address the displacement of Palestinian people to produce the state of Israel that took place after 1948. These pieces raise questions, without giving specific answers, about the effects on human lives of nation building. This persists as a problem in multiple countries and haunts both our pasts and our presents. As the title of one of his series The Erasure Trilogy makes evident, one aspect of this is how in time evidence moves into the past and threatens to be diminished or lost. Two parts of this trilogy, Memory Trace and Desert Bloom, are being shown here. Sheikh’s photographs make visible, in different ways, how both people and the landscape bear evidence to marks of obliteration and remembrance. The ultimate questions raised—from whatever partisan position one might take toward the creation of the state of Israel and its complex, world changing aftermaths—are not only ones of the cost and value of the result, but also, and moreover, Is there an alternative? Is there a less costly, more humane way of nation-building? And almost every nation has a related history. If works of art can raise the question effectively, they could possibly help us in formulating an answer. Memory Traces are portraits of places and people, now aged by nearly 70 years, who were displaced in the aftermath of the war of 1948. It includes photographic portraits, photographs of family photographs, such as Three Generations of the Mahmud Family, and photographs of buildings abandoned and left to the mute effects of time, such as 31˚47’46” N / 35˚11’46”E Lifta—Jerusalem District. Desert Bloom is comprised of aerial photographs of the land and takes its title from David Ben-Gurion’s statement of wanting to make the “desert bloom” in the Negev region. In works from Desert Bloom, such as 30˚57’14” N / 34˚39’25”E, the removal of people left traces of the past drawn across the land like lines on a page. 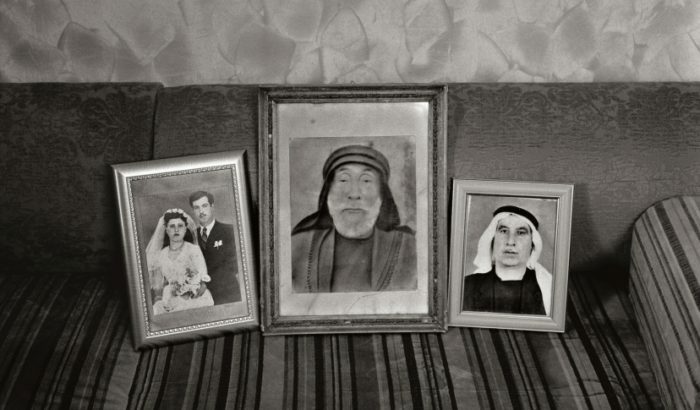 All Sheikh’s photographs are effective, along with their wall texts, in depicting the stories of this region, and particularly the reasons that passions persist among the displaced people from the Negev. The works are obviously defined by Sheikh’s desire to tell the story of the displaced, not the story of the forces on both sides of the conflict that led to the 1948 war. Two aspects of the photographs could be questioned: first, the interaction between the images and the texts, and second, the ability and potential failure of the exhibit to present the causes and contexts leading up to the upheavals on the people and the land. These are inter-related questions in Sheikh’s works, as they are in other contemporary art. The texts do provide a limited, focused context for the images, which speak beyond the particulars of their history to the broader concerns mentioned above. The photographs do not rely solely on their context for their poignancy. As they are works of art, part of their relevance is to pose the questions they are unable to answer. It is up to the viewer to extend these pieces into the informed context of the viewer’s experiences. In short, whatever view one takes, and conclusions one makes, the stakes are made more understandable through the human and environmental costs portrayed in these photographs. 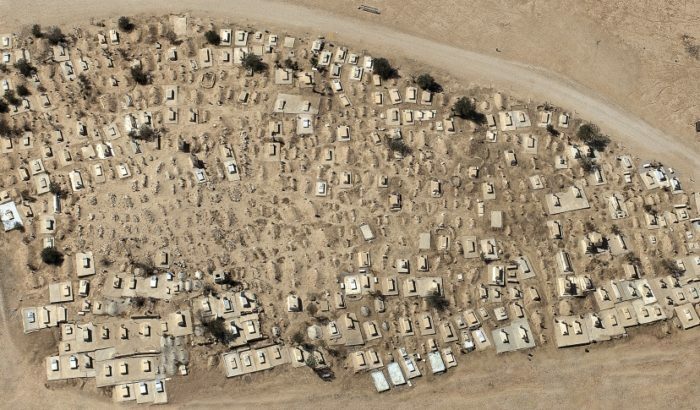 In addition to Memory Trace and Desert Bloom, a third work, Al-‘Araqib documents the repeated rebuilding and destructions of an Arab Bedouin settlement. This part of the exhibit consists of a projected video and documents and photographs gathered from the events, shown separately in a vitrine. Here Sheikh coordinates the presentation of the evidence he has gathered, the documents and videos being given to him by the community and people of Al-‘Araqib. The piece is effective for how well it reports on the claim to the territory and the repeated demolition of the tents of the settlement, as the people of the community repeatedly confront soldiers and bulldozers to little effect. At times the people retreat to tents set up in the community’s cemetery. In these works the line between documentation and aesthetic presentation reaches a limit often encountered in contemporary, politically engaged art. Reformulating a presentation can seem exploitative or too much of an intrusion or intervention, while leaving it too direct can risk leaning too heavily on its emotional immediacy and journalistic relevance. The use of a condensed video with a timeline functions well; however, the vitrines are necessary to complete the story but act more like wall labels than an inherent part of the work. Sheikh is a mid-career photographer raised in New York who is connected through family histories to Kenya and what is now Pakistan. He has documented and responded aesthetically throughout his career to displaced people around the world, in places such as East Africa, Pakistan, Afghanistan, Brazil, Cuba, India and Israel. He has received awards including a Fulbright Fellowship; Le Prix Dialogue de l’Humanité, Rencontres d’Arles; a MacArthur Fellowship and a Guggenheim Fellowship. His current body of work is being shown at Slought Foundation in Philadelphia and at five other venues, three in New York: at the Brooklyn Museum, the Storefront for Art and Architecture, and Pace/MacGill Gallery. The final two are the Al-Ma’Mal Center for Contemporary Art in East Jerusalem and the Sakakini Cultural Center in Ramallah. Tom Csaszar is a painter and writer based in Philadelphia. He is on Graduate Faculty of the Pennsylvania Academy of the Fine Arts.